Joel Henry Hildebrand was an American educator and a pioneer chemist. He was a major figure in chemistry research, specializing in liquids and nonelectrolyte solutions. Hildebrand graduated from the University of Pennsylvania in 1903. 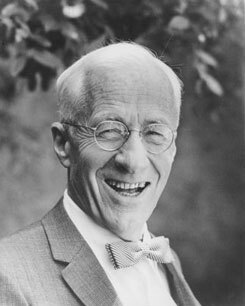 He served briefly in the faculty before going to the University of California, Berkeley as a chemistry instructor in 1913. Within five years he became an Assistant Professor. In 1918 he was elevated to Associate Professor before finally being granted Full Professorship a year later in 1919. He served as the Dean of the College of Chemistry from 1949 through 1951. He retired from full time teaching in 1952 but remained a University Professor at Berkeley until his death. Hildebrand Hall on the Berkeley campus is named for him.